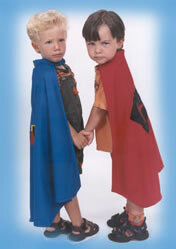 Kid-sized Supercapes fit from age two to early teens. Larger teens may wish to go with the Teen or Grown-up size. A Kid-sized cape is 28" long, with a 17" neck. On an 18 month old, the cape might drag on the ground a little. The "serious super heroes" in the photo at the right are 3 years old. Our capes usually take about 4 business days to make (a little longer for a custom cape). Arrival time depends on the shipping method, and your destination (we're in California). Our capes are custom designed to fit comfortably. Each cape is sewn with double-hemmed edges and made from 100% polyester for durability and washability. Find out more in our FAQs section. See our gallery for custom ideas on the unique things we can put on the capes. One of our key features is the magnetic closure used to fasten each cape safely. We found they will come apart if the cape gets caught in something unlike a cape that is tied on, which could be a choking hazard. Children can put the cape on "all by myself," without help from a grown up. Velcro wears out over time, and can scratch tender skin. Our magnets will never wear out. Find out more about our magnetic closures in our FAQs section. There are many colors to choose from. You can even create your own! Contact us about using your own colors.